This is a Post from the Symbol Surfing Blog from Tue, Aug 21, 2018. This semiconductor stock looks like it was recently at support and is now ready for a bounce off of the low $80s. The resistance seems to be around $95. A $10 move looks possible. 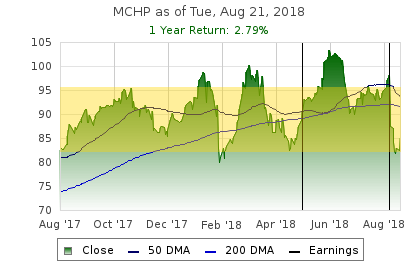 In case you are wondering how I found this stock, MCHP was one of the stock market gainers today. This is one of the Symbol Surfing lists I scan daily. I was ready to buy some shares. Before making a final decision though, I went through my trading check list. The trade idea passed all the tests except one. Do you currently own a stock in the same industry? As I scanned my portfolio in my Symbol Surfing account I started typing semi... and there was 1 result. I just bought some Nvidia shares on Wed, Aug 8, 2018. So I passed on this one for that reason. I will trade this as a "paper trade". Paper trading is a great way to practice investing without the risk of course. If I didn't already own NVDA, I would have purchased MCHP today. What's the big deal with owning multiple stocks in the same industry anyway? First of all, there are many successful investors that buy several stocks in the same industry. For me, as a small investor, I want to be as diversified as possible. With stocks, I am referring to owning stocks in different sectors and different industries within those sectors. In the Symbol Surfing website, there are several lists of stocks by sector and by industry. This is a great way for me to scan for trading opportunities. If you think your friends would like this post, please share it. Thanks!